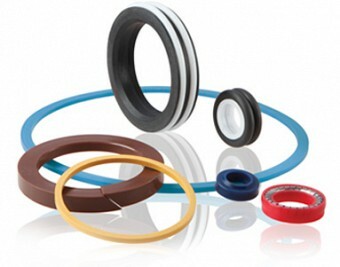 There’s no room for compromise if your business relies on lasting, consistent quality seals. All Seals supplies seals and related customer-designed parts to demanding OEMs in the fluid power, chemical processing, agricultural, food & beverage, plumbing, wind energy, aerospace, automotive and other markets. Our manufacturing processes include injection, compression and transfer molding as well as machined plastics. Our seal vendors include respected domestic and international companies with strong quality engineering programs. Additionally, All Seals provides extensive value added services such as JIT/Kanban programs, pre-production and kitting, engineering design, special marketing and packaging options and much more. For more specific material recommendations, please refer to our compounds brochure. For more information, quick quotations, expert consultation and responsive customer service call us at 800.553.5054. A rigid plastic such as PTFE, UHMWPE, Acetol, PEEK or nylon is used in conjunction with a metal spring. Available in many different filled PTFE and spring force combinations. A multiple stack of vee rings and adapters to pack glands for applications with large radial deflections. New improved design with snap-together components in a combination of thermoset rubbers, filled PTFE and thermoplastic parts. A PTFE jacket with a thermoset rubber core used to re-pack worn stems on gate valves. The two materials are joined during manufacturing with a chemical and mechanical bond. For severe rotary applications a bonded thermoset rubber or thermoplastic to a PTFE cap is required. This combo seal will reduce friction torque and can handle higher temperatures and greater eccentricities than conventional rotary seals. With our highly trained engineers, All Seals can design a custom seal for even the most complex applications. We love a challenge and have the experience to design a working solution on time and on budget. Just ask! There’s a reason All Seals is one of the largest industrial seal distributors in the world. Our customer service levels are unmatched in the numerous markets that we serve, a few of which we have listed here. We have large accessible inventories, multiple locations, in-house engineering, quality control systems and an expert consultative sales staff. All Seals’ mission is to give you a one-stop seal sourcing experience that merits your highest seal of approval.